Taille de cet aperçu PNG de ce fichier SVG : 800 × 480 piksèl. Autres résolutions : 320 × 192 piksèl | 1 024 × 614 piksèl | 1 280 × 768 piksèl | 1 000 × 600 piksèl. 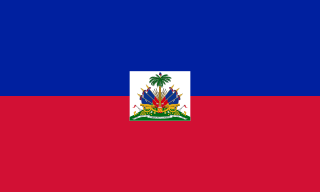 Voir aussi  : en:Flag of Haiti epi en:List of Haitian flags. Voir aussi les catégories : SVG flags of Haiti et SVG flags - historical of Haiti. (Anpil resan | Anpil vye) Gade (10 ki fèk fèt yo) (10 pi vye yo) (10 | 20 | 50 | 100 | 250 | 500). Kounye a 17 fevriye 2019 à 16:21 1 000 × 600 (21 Kio) FDRMRZUSA Corrected imperfections in coat of arms. Further svg code optimization. No other changes. 14 fevriye 2019 à 18:37 1 000 × 600 (21 Kio) FDRMRZUSA Centered coat of arms. Further svg code optimization. No other changes. 10 janvye 2019 à 17:08 1 000 × 600 (22 Kio) FDRMRZUSA Higher svg resolution from same file (latest version): resized by "Inkscape". Same proportion: 3:5. Optimized: reduced code. No other changes. 26 desanm 2018 à 16:21 500 × 300 (43 Kio) FDRMRZUSA Corrected horizontal lines in palm tree and position of palm tree. 24 desanm 2015 à 05:13 500 × 300 (32 Kio) Savvyjack23 Appreciate the effort Crisolympic16 but these aren't the correct combinations. See "flown" flags of Haiti, you will not find one that resembles yours. 22 desanm 2015 à 18:40 500 × 300 (146 Kio) Crisolympic16 Fixed elements of the Coat of arms (Flags, Palm, Hat, Drum, Cannon, Anchors, Chains, Cannon Balls, Helmets, Guns, Trumpets, Pennants and Axes) and fixed Colour Palette.